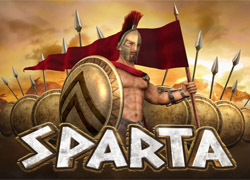 Sparta slot is another new release from playtech. It brings you a slice of Greek history – of the Spartans! With 5 reels and 30 paylines Sparta slot has the added feature of Gamble. The graphics and sound effects of Sparta online slot are superbly packaged with an exciting locale – an ancient battlefield of Spartan warriors and warships! What’s more the slot payouts are equally exciting and handsome. The Scatter is a Spartan phalanx and 3 of these symbols anywhere on the reels payout 15 free games and a double multiplier! You can also win free games infinitely during this feature. The Scatter gives you excellent payouts on lines, just like the other symbols. The Wild is a Warrior which expands giant-like in stature on reels 2, 3 and 4! Other symbols are a catapult, urn, sword, shield and a warship. Every time you hit a big payline with the warship it transforms into a short animated video of a fleet of triremes approaching enemy port! You can bet per line where only the highest win pays and win combinations pay from left to right. Only the Scatter pays on any payline on the slot. Alternatively, you can click on Bet Max to activate all lines. Payline bets are multiplied by the line bet. 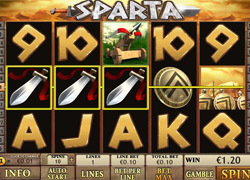 In the Gamble section of Sparta Slot , you select your bet – half-double or double. Dealer’s card opens on the left and you flip the player’s card; aim is to pull a higher card. The Info tab explains the game and you can bet from 1 cent to $/€/£5 per line bet or Bet Max.